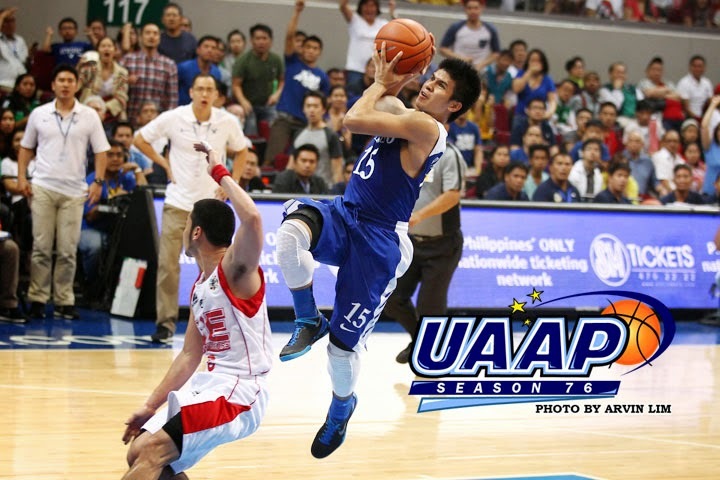 Kiefer Isaac Ravena of Ateneo Blue Eagles performed big on August 10, 2014 (Sunday), intimidating the score of UE Red Warriors with almost continuous shoots at the overtime game to complete 93-91 win. A few seconds left at the 4th quarter, UE leads with 80 and Ateneo 78. But Ravena made a fast move making a 2 point shot at 0:23 seconds left, leaving both teams for overtime. At overtime, Ravena scored another 7 out of 13 points made by his team. The former UAAP Rookie of the Year finished with his record-breaking 38 points, along with nine assists and five boards. Ravena bagged his second UAAP Press Corps-Accel Quantum Plus/316 Player of the Week award. In the second game, the DLSU Green Archers won victoriously against UST Growling Tigers with 83-70 score. La Salle is going to its winning streak again making 5 straight wins, giving them the second spot in the tally board.